What motivated you to start dealing in classic African art? I met and married my wife Eve in 1992. We spent our honeymoon in Tanzania. We bought a few odds and ends while we there, and in our first year together we bought a number of pieces from a trader of Liberian origin. Through this trader I met other African merchants who came to me both to sell and have bases made for works of art, real and fake, that they were selling to clients around the country. Most of these traders were more than happy to trade artwork for base-work, as they were frequently strapped for cash or at least pretended to be. I began to accumulate a few objects as a result and, inevitably, someone would admire something I had acquired and ask how much I wanted for it. There were also pieces left with me by traders and dealers that other clients asked after. It didn't take long to figure out that there was money to be made by connecting people with material. 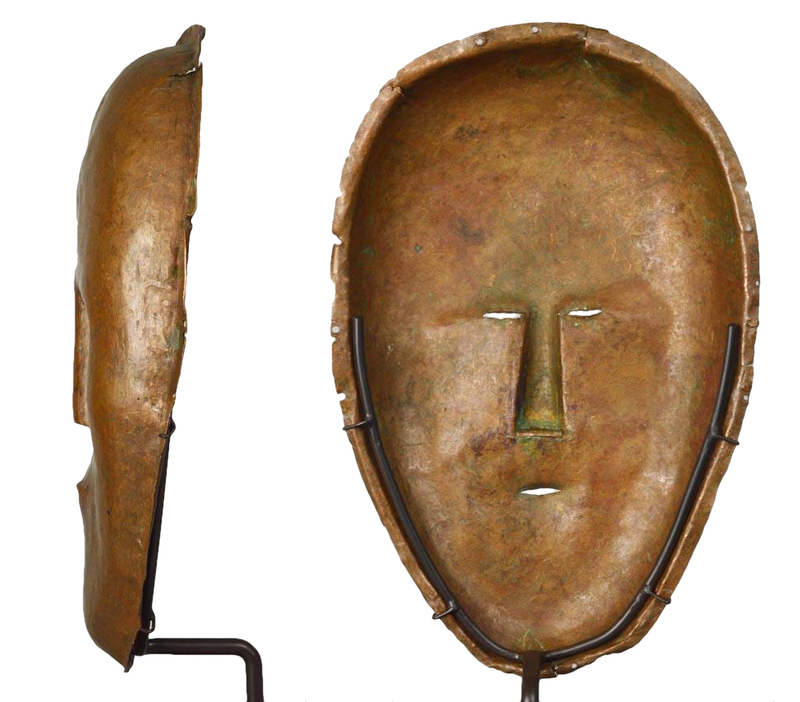 Masks are fabricated from thin brass and copper bowls and platters imported from Egypt. What was the first piece you sold? One day, a Mandingo trader dropped by in the morning with a suitcase full of carvings of Angolan origin. Among the items was a marvellous old rendering of two monkeys on a branch that had probably come off an old chair but which stood on its own as sculpture. That same afternoon, the collector Noble Endicott, dropped by to drop off some objects for mounting. I showed him the piece and he seemed immediately entranced, and asked how much I wanted for it. I'd owned it all of an hour or two and told him I needed to think about it and would let him know. Later that day, he called and offered me three times as much as I had been contemplating. It wasn't my first sale, but it was the first memorable one. By the late 1990s, the growth of online commerce was beginning to be felt. A lot of good older material was showing up on a new, online marketplace called eBay. In those years, it was possible to track buyers, learn their habits and figure out who was buying what. Boot fair pickers in the UK were bringing antique wares to the international marketplace for modest prices and running back for more. 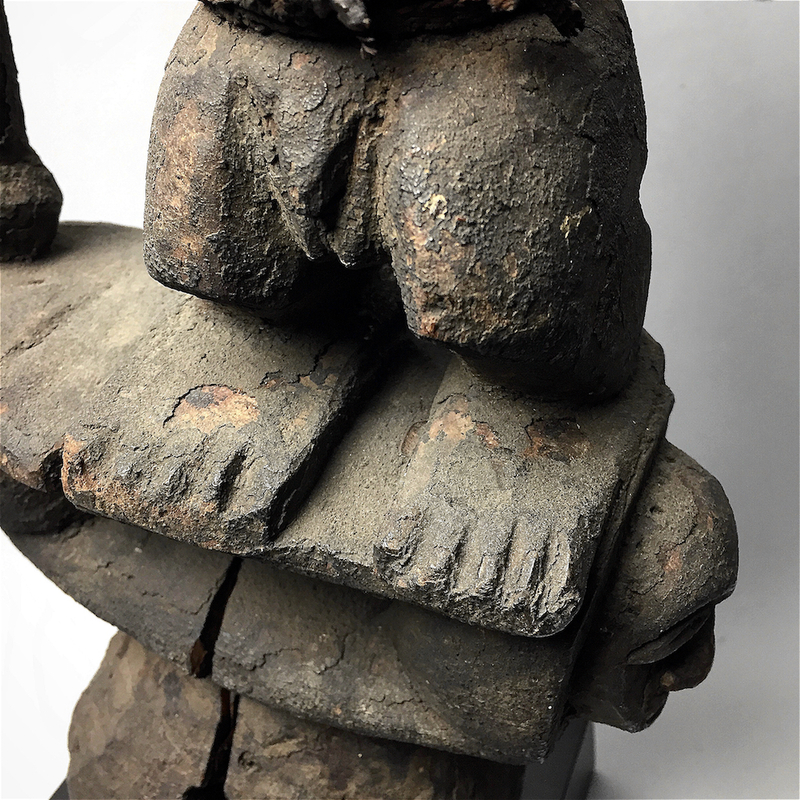 Homeowners were emptying out their attics and storerooms of all manner of things from 19th-century nutcrackers to Zulu headrests. One evening after my children had been put to bed I found a pair of 19th-century Bari headrests listed as Japanese pillows and available for all of £100 apiece. It took a while, but the two eventually earned me $7,500. This began to happen with some frequency and, in the process, I developed relationships with many individuals who I consider friends and colleagues to this day, people like Adam Prout, Owen Hargreaves and Norbert Rotcher. Can you discuss a few of the major high profile pieces you've sold? In 2006, I spotted what appeared to be a Benelulua figure on eBay UK. The carving was of such exquisite quality that I concluded the piece could only be a masterpiece or a casting in resin. To be the latter, there would have to be an original somewhere, but a review of all the Benelulua figures I could find showed no match. I set up a snipe bid of several thousand dollars and watched the auction close out, refreshing my browser repeatedly at $2,000 and then $2,025 until the system froze and I had to restart my old Dell computer. When it eventually came back online, I learned that I had won at $5,000 and change. 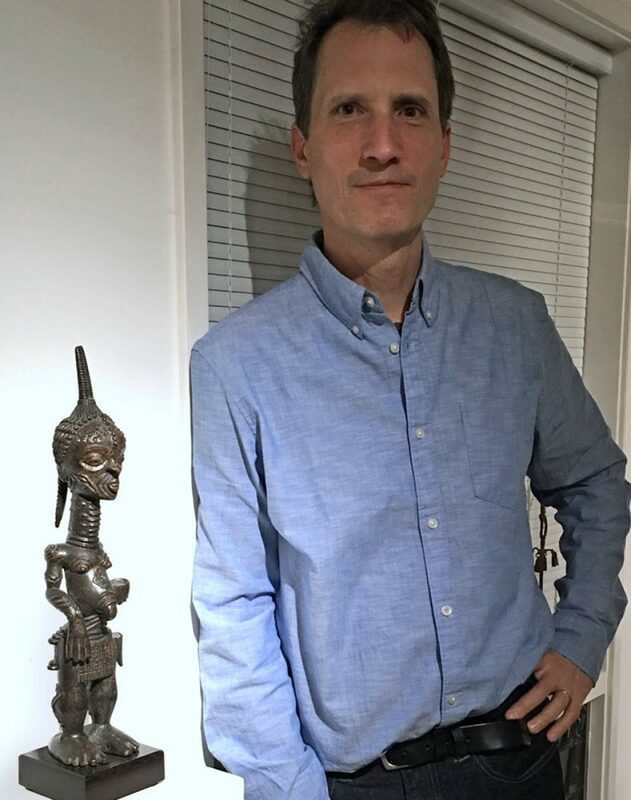 It took another 10 tense days to receive the piece from the owner in Liverpool, including a two-day delay at customs to query me on the type of wood the figure had been carved from. When I finally unpacked the piece and set it on my counter, I was in awe. My wife rarely came to the shop, but she was there that morning. “Cool,” she said, “is it everything you thought it would be?” “Better,” I said. 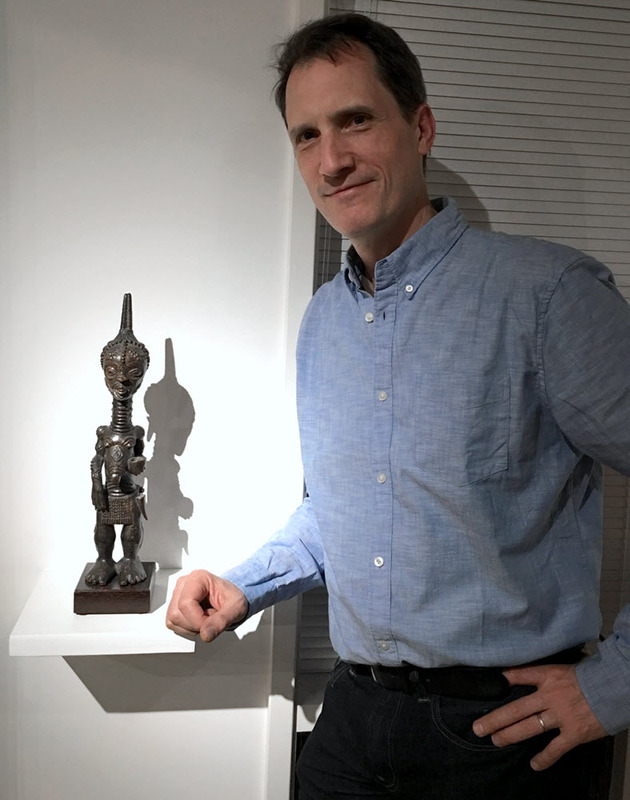 “It’s a masterpiece.” I consigned the piece to my friend Carlo Bella at Pace Primitive who sold it for a substantial sum. The piece appears on page 199 of ‘Embodiments’. It turned out to have been published by Ivy Underwood in 1947 and by Fagg in 1952. It was formerly in the collection of William Ockelford Oldman, London. What steps do you take before a purchase? Even though first impressions are more often than not correct, I try to avoid hasty decisions. I try to take note of my first thoughts, and then look very closely. Now that I'm no longer young, I find wearing magnifying glasses a big plus. In this way, one can pick up details like repairs that the naked eye will miss. For objects on the internet, it's vital to get additional images, particularly from different angles as well as close-ups. When possible, it's a good idea to get impressions from colleagues who might know the region better than I do. An Africanist who's lived amongst the Igbo will have insights only such experience can provide. There is also a mental checklist; for masks, does the back show wear consistent with the way it was used? Does a pulley have spindle wear? There are many factors to look for and consider, too many to list here. Do you think it's necessary to have knowledge of the history or traditional use of the pieces you collect? Provenance doesn't matter as much to me as objective evidence of use or knowing what an authentic 'fill-in-the-blank' looks like. And while wood can be made to look old, you can't make young wood old. 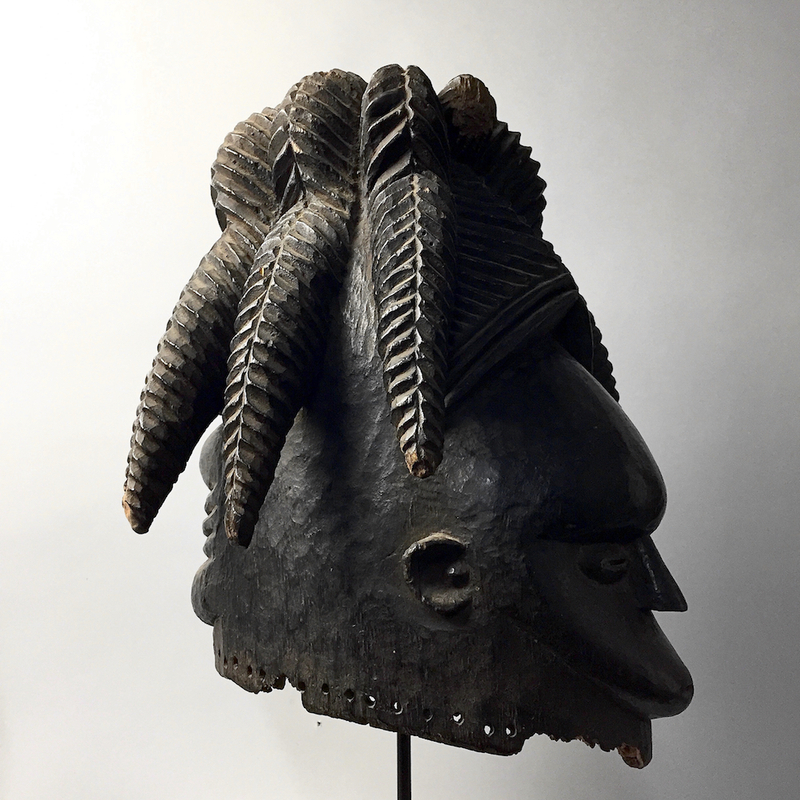 I once sold a Makonde mask to a colleague, who sold it overseas. 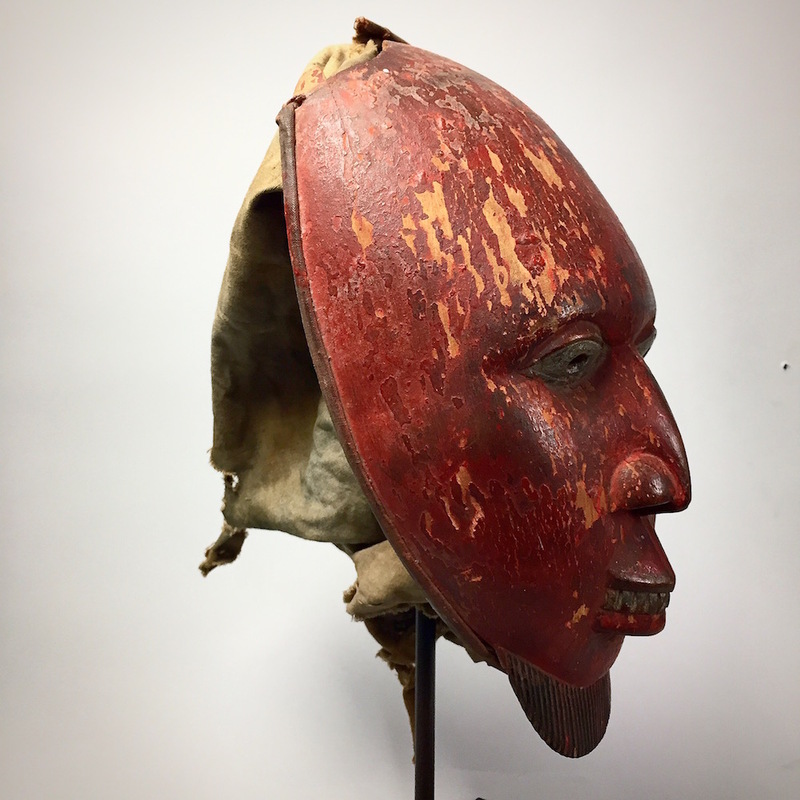 The mask came from a collection in upstate New York, where it had been since the early 1960s. The person I got it from, studied the Makonde material in the field and at museums in Mozambique and Portugal. The carving was firmly dated to the 1940s. 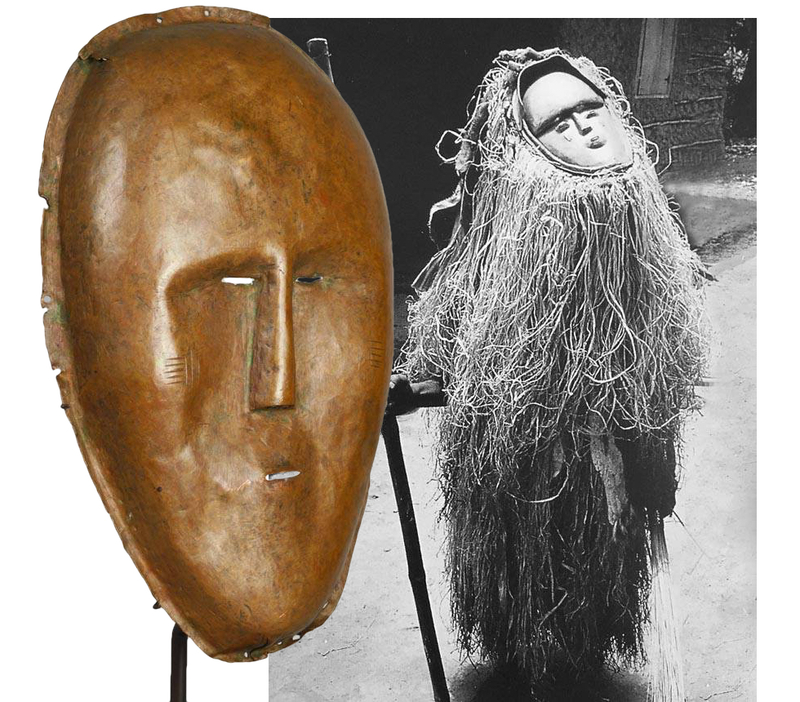 The same mask was subsequently featured in a book and registered on the Yale archive with a made-up provenance linking it to a German officer before WWI. If you can fake a carving, making up false papers is child's play. It's important to remember that fakes are made just for us; beware of beauty. When it comes to use, there's a dilemma: an object can be old and used a lot, or old and collected long ago after relatively little use. I would buy both. I would also buy and sell a mask or figure made by a master carver 80 years ago in traditional style that was never used. What matters in such cases is that the work is traditional and honest, with no attempt having ever been made to age it or to give it the appearance of use. Who are your typical customers and how do they find out about you? When I started making bases, I mailed letters to five dealers whose names and addresses I’d collected from the one dealer I already knew. Three of those individuals responded positively and became regular clients. From that point on, most new clients were acquired through word of mouth, although I did cold call a number of people, mostly dealers, I’d heard about. I wish now that I had done more of that, as I would have certainly met—and might have developed relationships with—such people as Alan Stone and William Brill, among others. Later, I placed a few ads in publications such as the catalog of the O.A.N. bookstore and Tribal Arts but there was never much evidence of response. Once the internet had grown to prominence as a marketing venue, I decided my advertising dollar was best spent there. 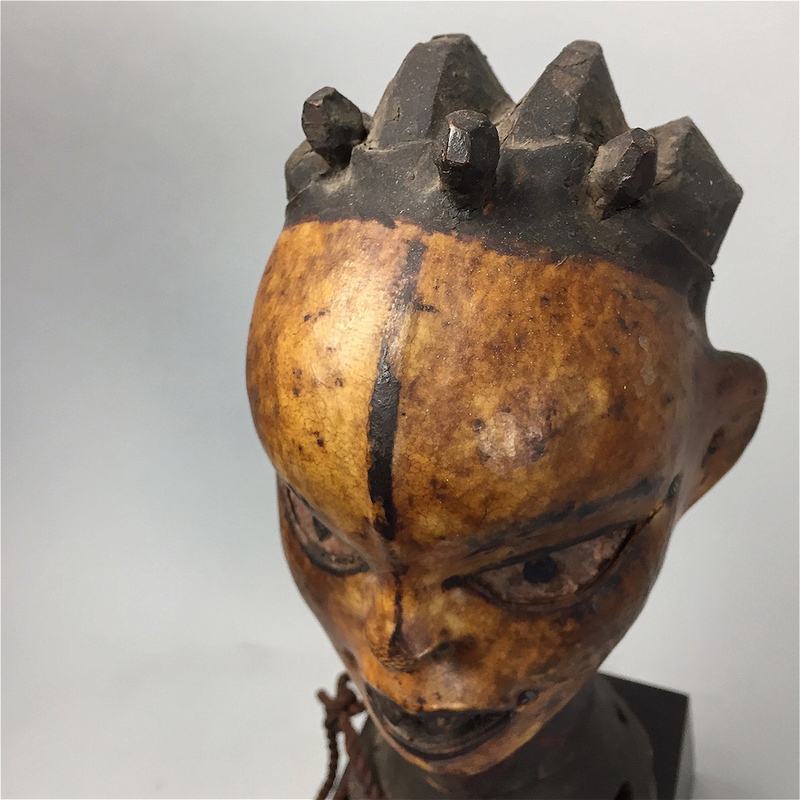 Do you exhibit in any fairs dedicated to African art? If so which ones and why? The only art fairs I've participated in have been in New York and California. The annual San Francisco Tribal show falls in February when it's cold and miserable in New York and often springlike in the Bay area. Participating there is almost like a vacation. There are two main reasons I don't participate in shows in Europe. The first is that half my business comes from making bases for collectors, galleries and designers. Not only would I suffer the expenses of doing the show, I would lose out on business that's always there and still have to cover my daily costs of operation. Of course, by traveling I would meet new clients, but I would also incur the worries of shipping my property a great distance and across international borders. Another factor is that my business's inception coincided with my starting a family. Participating in more shows would have taken me away from my children for more time than I was willing to sacrifice. How is the market different now from when you first started dealing? A great deal of authentic African art was still coming from the continent when I started. Yes, a lot of it was fake, particularly from countries that had been picked over by this point for 30 years, but even then countries like Cote d'Ivoire and Zaire still held secrets. 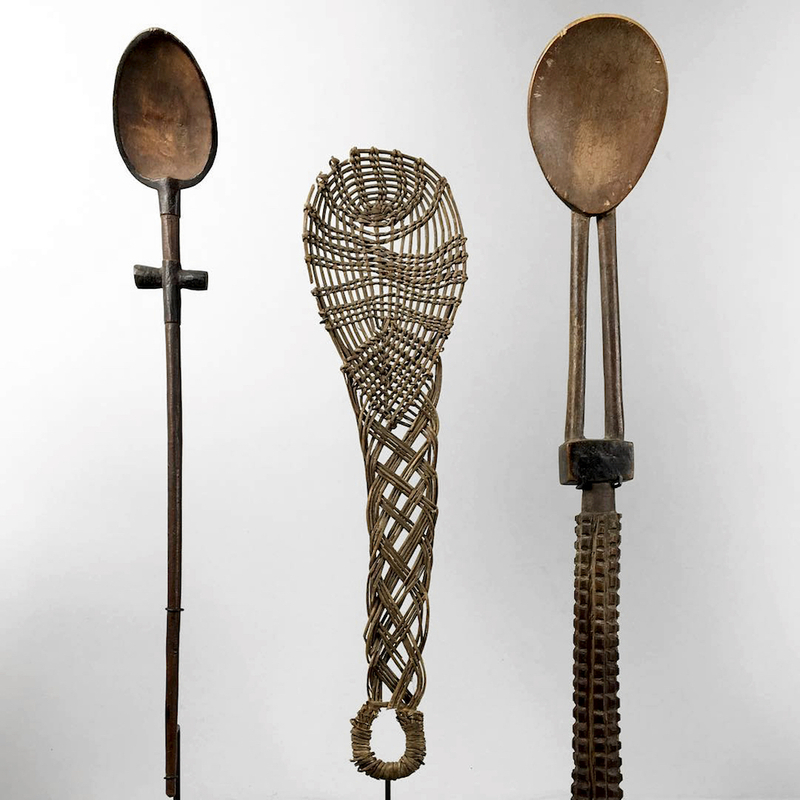 And not only did they retain some works of traditional figurative art, much of Africa's traditional currencies, ceramics and other daily and ritual regalia had until now been largely overlooked. Areas such as Nigeria's upper Benue and much of Tanzania had barely been tapped. Until around 2005, I experienced one region after another provide quality art and artefacts, theretofore largely unknown to the market, appear and go into rapid decline. They were, in approximate order and often overlapping: Eastern Nigeria (which outlasted them all), South Africa, Tanzania, Northern Congo and Southern Sudan. Often, the reasons for the sudden appearance of material from a particular place was political. 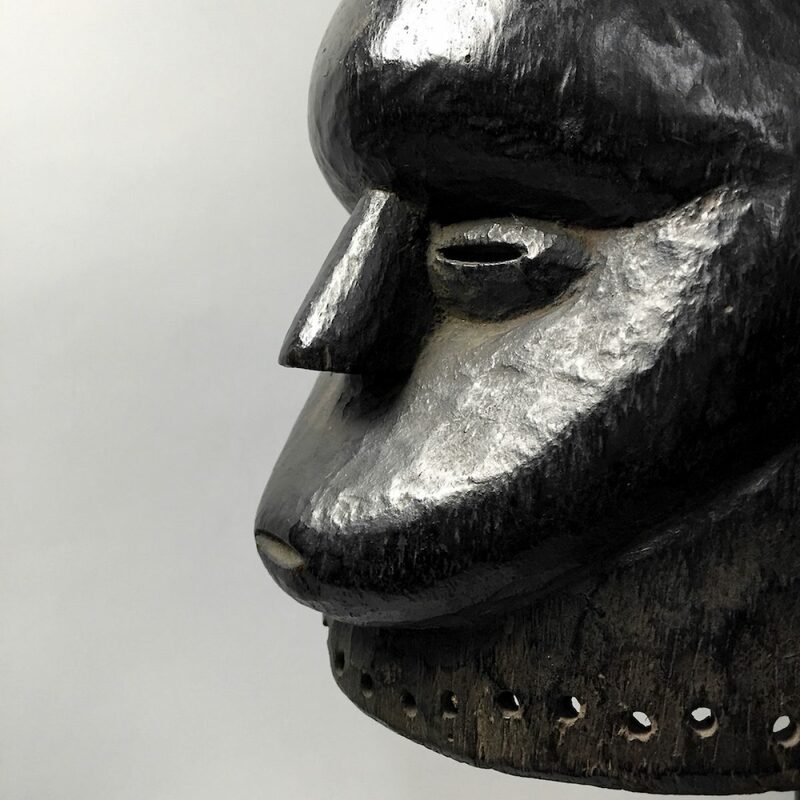 For instance, the consolidation of political power in Uganda and the downfall of Mobutu in Zaire opened up Southern Sudan and Congo’s Northeast to art traffickers and the export of Bongo posts, Azande pottery and the like. As a dealer, do you see any trends emerging in the market? More and more, commerce and communication occur over the internet. At the same time, population rise and the increasing concentration of wealth in cities has made real estate close to that wealth very expensive. Combined with the fact that material is no longer available as essentially secondhand, no longer vital goods at its source, but instead as the deaccessioned property of western elites, the return on investment has declined. This has meant the closure of businesses such as Craft Caravan in New York City and other streetlevel shops and galleries that introduced the greater population to authentic ethnic art; rents and the cost of material rose while the supply of that material declined. The lack of entry-level, honest and affordable material makes it harder for new collectors to get started and educate themselves. It also makes it challenging for businesses carrying tribal art to sustain themselves. At the same time, a growing disparity in incomes has further concentrated wealth at the top and relegated competition for the perceived finest works to a relatively small group of buyers. 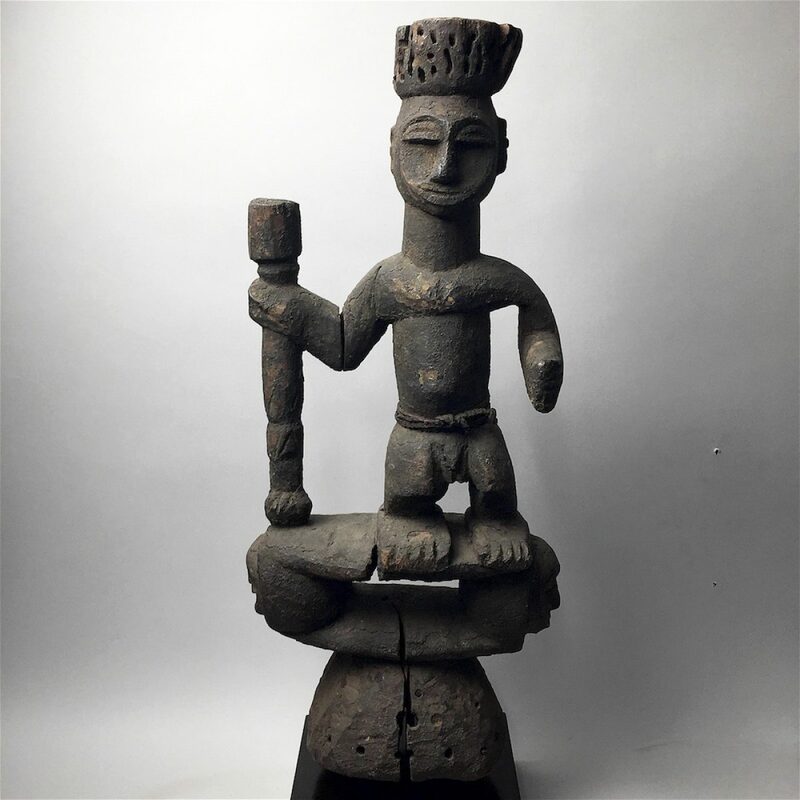 This, in turn, creates an illusion of chaos in the market where one nkisi sells for millions and another, perhaps slightly lesser example sells for $80,000. The result is that collectors have become very uncertain about what anything is worth. How do you think the market will change over the next five years? Growing up in New York, I saw examples of ethnic art in many—if not the majority—of upper middle-class homes. Africa was cool, and its art projected liberal ideals plus a sophisticated understanding of the roots of modernism. Modernism is approaching the century mark and traditional African art is now that much more the material of a bygone era. 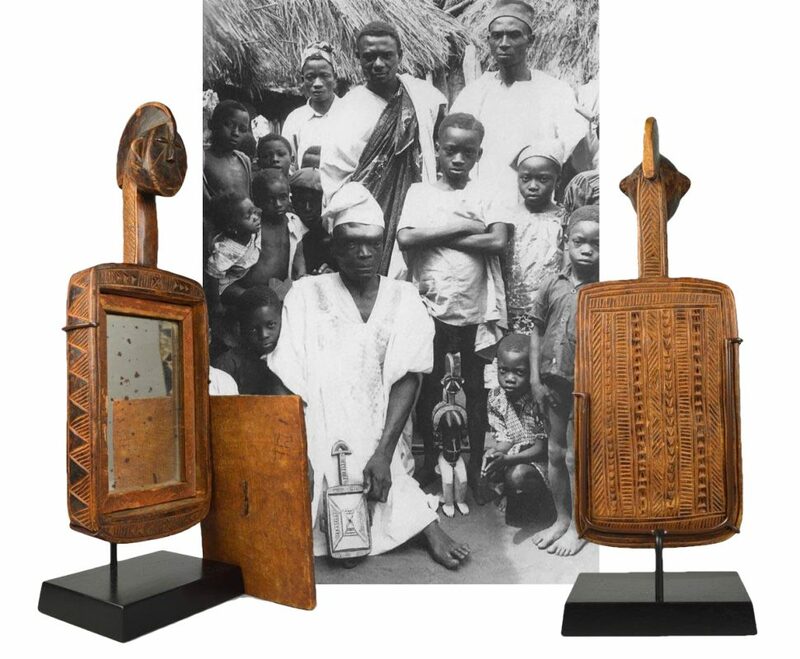 In addition to the modern art connection, a great many collectors and dealers were devoted to African art because of an affiliation with Africa through service or travel. The impetus came from starting collections abroad or by way of nostalgia. 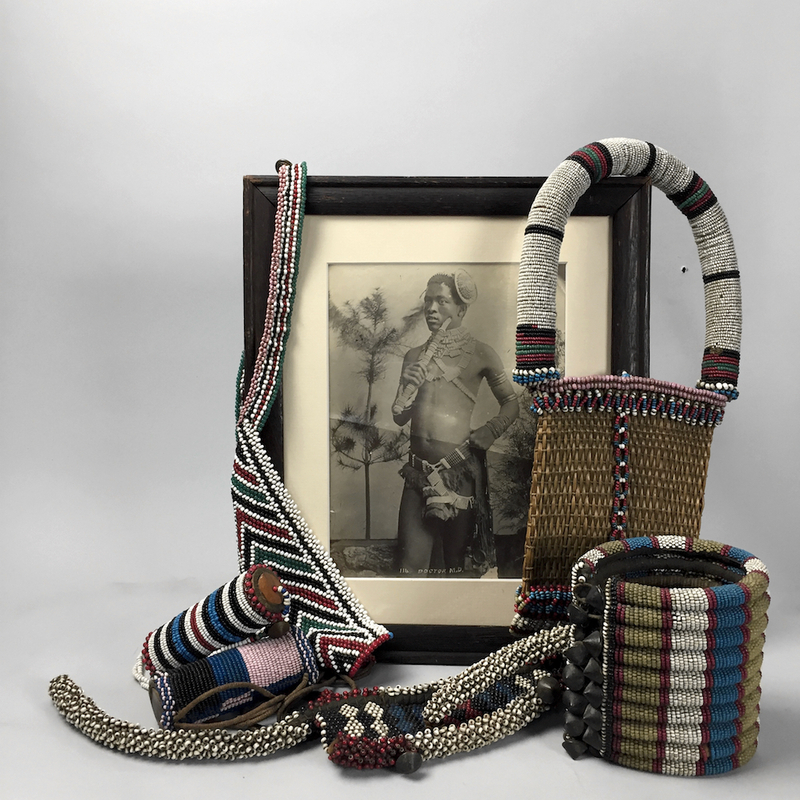 Living in Africa today brings the visitor into far less contact with traditional customs than one would have experienced, say, in the 1950s and '60s when the great collectors like Jay T. Last got going. "Africa was cool, and its art projected liberal ideals plus a sophisticated understanding of the roots of modernism." The era when individuals of modest means could assemble a great collection is in the past. I suppose a few clever people with great passion might test the accuracy of that statement, but they are rare indeed. Those who bought in the prime years of export are gone or in their 80s and 90s. With notable exceptions, the best material will trend to institutionalisation and get snapped up by well-heeled collectors. The net effect is that it will be harder for new collectors to get started and more difficult all around to find and secure good material. By extension, this means the median quality of goods available to buyers will trend downwards, with an occasional blip of good material as estates come online and get divvied up. But life is long. For the 35 year old collector, the tribal market will seem pretty much the same in 2021 as it is today. For those with a longer perspective, the market will seem that much further from the golden years of their choosing, whether it be the ’50s, ’60s, ’70s or ’80s.